The new safety system ESL from EUCHNER is a multifunctional door handle for protecting and monitoring safety guards such as doors and flaps on machines and installations. The safety system ESL combines a safety switch, door handle and door stop in one device. It consists of a handle module and an interlocking module equipped with integrated transponder-coded safety technology. The ESL is used to safe guard and monitor safety guards such as small hinged doors and l aps on machines and installations. The use of transponder technology ensures maximum safety according to EN ISO 13849-1 (Cat. 4 / PLe) and provides the best possible protection against tampering. Parco’s T-slotted extrusion frames are perfect for your guarding needs. Now they can also powder coat the extrusion in safety yellow for higher visibility. 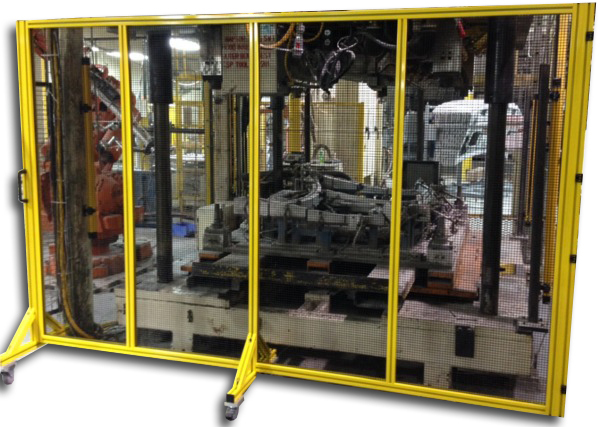 Wire partitions and Lexan perimeter guards protect your operators from automated and robotics equipment, and provide a safe and clean environment. WERMA is introducing a new elegant signal tower range to the market. Signaling Technology in its most spectacular form ClearSIGN combines a slim unobtrusive design with cutting edge technology and functionality. The homogenous light effect is particularly impressive and when a light is activated comes to life in a unique form. ClearSIGN uses purely LEDs which help create an unobtrusive minimalistic design with a high level of functionality. RGB LEDs allow a wide variety of colors to be selected for any tier of the tower giving the operator maximum flexibility in choice of light effect and color. The optical signal can be enhanced with an optional audible alarm. Compact and lightweight design with advanced functionality! The new Panasonic SF4B-C safety light curtain utilizes a proprietary double-structure enclosure which features a lightweight plastic body with a metal inner frame to increase overall toughness. Because of the compact size, the SF4B-C Series can be mounted flush to a machine frame, thus minimizing the device clearance, all while maintaining zero dead zone coverage. We are proud to announce the addition of Euchner to our product offering.